The world changed in 2001 because Sept 11 happened. But 2001 was also a watershed year for Corporate Malaysia. The bumiputra corporate agenda was restructured in a significant way after the collapse of two major conglomerates under a mountain of debt during the 1997/98 Asian Financial Crisis (AFC). Remembering how the restructuring was carried out in 2001 and appreciating the reason it was done the way it was is important. This is because of the current debate on whether government-linked investment companies (GLICs) and government-linked companies (GLCs) have performed well, if their board of directors (BODs) and top management are overpaid, and whether they have achieved the objectives set for them. Before we discuss 2001, let us go back another decade back to before 1990. The bumiputera, specifically Malay, corporate and entrepreneur community, was very small even after 20 years of the New Economic Policy (NEP), which was launched in 1971. Most of the opportunities and tasks to achieve the 30% share of wealth were driven by GLICS like Perbadanan Nasional Bhd (Pernas) and Permodalan Nasional Bhd, or through investment schemes like Amanah Nasional. This changed significantly in 1984 when Tun Dr Mahathir Mohamad brought Tun Daim Zainuddin into government as minister of finance (MOF). A lawyer-turned-entrepreneur, Daim pushed for the creation of a strong class of Malay entreprenuers — and this was quickly achieved because of the opportunities that opened up with Mahathir’s privatisation policy. It was during Daim’s tenure as MOF till 1991 that a small group of Malay professionals became entrepreneurs and built large corporations. The two biggest names were, of course, Tan Sri Halim Saad (Renong/UEM conglormerate) and Tan Sri Tajudin Ramli (TRI/Celcom/MAS). Others were were not as big as Halim and Tajudin, but were prominent nonetheless. They included Tan Sri Azmi Wan Hamzah (Land & General Bhd), Tan Sri Samsudin Abu Hassan (Landmarks Bhd), Tan Sri Razali Abdul Rahman and Datuk Hassan Abas at Peremba/Saujana. When Datuk Seri Anwar Ibrahim took over as MOF in 1991, he helped build a new cluster of bumiputera businessmen. One of the corporate entities that stood out was Realmild Sdn Bhd, which ended up owning Malaysian Resources Corp Bhd (MRCB), which had two other listed companies in its fold — The New Straits Times Press (M) Bhd and Sistem Televisyen Malaysia Bhd (TV3). MRCB was soon to rival the Renong/UEM Group as it expanded aggressively during the go-go years of the Asian economic boom in the early 1990s. Like many companies elsewhere in Southeast Asia, in particular Indonesia and Thailand, several Malaysian corporates went under too. In Malaysia’s case, the three biggest bumiputera-owned companies and their owners collapsed under a mountain of personal as well as company debt. They had taken large personal and company loans, charged against their shares in the companies, to fuel their aggressive expansion. Malaysia was thrown into political and financial turmoil when Mahathir sacked Anwar in 1998 and imposed capital controls. A massive political and corporate clean up followed. Malaysia Inc had to be remade. 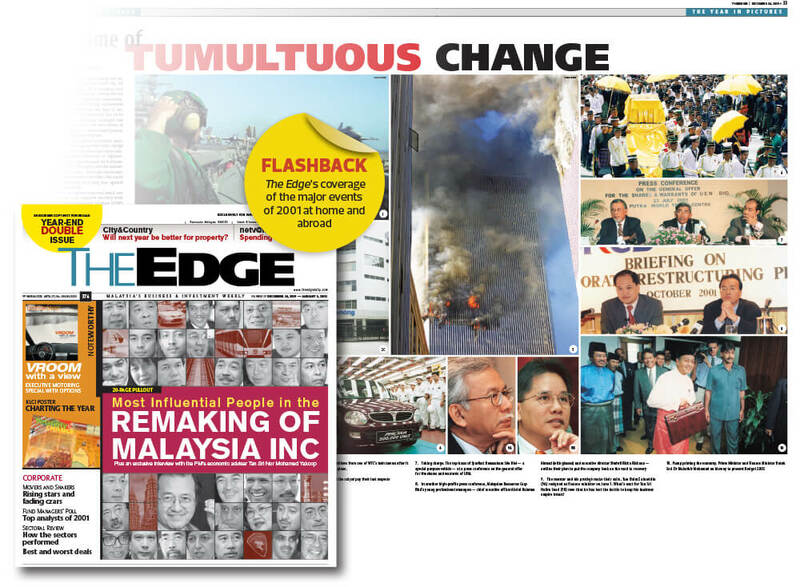 While the sacking of Anwar triggered three years of frequent Reformasi street protests that had to be dealt with, Mahathir also had to deal with the problems at MRCB, Renong/UEM and Malaysia Airlines, which posed a risk to the banking system and was a drag on the stock market. Should the government bail out the shareholders and their companies? Those who supported this argument said the AFC was caused by speculative attacks on Asian currencies and equities by hedge funds and was not the fault of the companies and their owners. Or should the government let the owners fall and save only the companies and the thousands of jobs and assets that were in them? This school of thought, which prevailed in the end, believed that the owners had been reckless and should take responsibility. Daim returned as MOF in 1998 after Anwar was sacked. But Mahathir by then had another person by his side as adviser at Bank Negara Malaysia — Tan Sri Nor Mohamed Yakcop — who had helped design the capital controls regime. In December 2000, the MOF approved the government’s purchase of a controlling stake in MAS from Tajudin-owned entity Naluri Bhd at RM8.00 a share. This provoked a public outcry because it was deemed as a bailout of a so-called crony. In May 2000, Mahathir took Nor Mohamed out from Bank Negara Malaysia and made him economic adviser to the prime minister. One month later, on June 1, Daim resigned and Mahathir took over as MOF. Nor Mohamed Yakcop was appointed MOF 2 in January 2004, but the work to reconfigure the bumiputera corporate agenda started as soon as he was appointed adviser to Mahathir. The decision was made to save troubled giant bumiputera corporates such as Renong/UEM and MRCB, but not their controlling shareholders. The end result was that by the time the clean-up was done in 2003 after a series of restructurings and injection of fresh capital, MRCB/NSTP/TV3 and UEM/Renong Group ended up under the fold of GLICs — the Employees Provident Fund (EPF) and Khazanah Nasional Bhd, respectively. They would be managed by professionals who would be remunerated based on their performance and in particular, their ability to create value for shareholders, while at the same time helping the government to carry out its socio-economic agenda. As these professionals did not need to own any significant stake to manage the companies, unlike an entrepreneur, they would not have to borrow large sums of money and have to worry about servicing bank loans. The thinking then was this was a better option after the AFC. What should be the appropriate role of GLCs in a country is always a subject of debate anywhere. In Singapore, GLCs are accused of crowding out the private sector because of their sheer dominance and size. In Malaysia, there are some who share the same view. Besides the entrepreneurs themselves, think tanks like the Institute for Democracy and Economic Affairs (IDEAS) believe very much in having an absolute free market and that GLCs should have very little, if any, role in the economy. It should be noted, however, that Malaysian GLICs and GLCs, unlike their Singapore counterparts, are expected to help the socio-economic agenda of the government, in particular to aid the bumiputera community. Professor Terence Gomez of University Malaya, who has written extensively on GLCs, politics and business, made a good point when he met the Council of Eminent Persons (CEP), chaired by Daim, last week. He said while it is timely for a review of the role of GLICS and GLCs, the government must be clear about what it expects from them. “Are they supposed to be a (pure) commercial entity, or have social orientation (as well)? And if they are supposed to do both, can they really fulfil the goals?”, Gomez asked. Clearly, there are many opinions about the role and set-up of GLICs and GLCs. Should the government hand control of some GLCs back to entrepreneurs? Can these entrepreneurs serve the social economic agenda the government wants while maximising their return on investments? Or should the government continue to keep these companies in its fold and let professionals run them — minus political appointees — as Mahathir himself said on July 6? Indeed, what is a political appointee? Is a political appointee a politician, retired or active ? Or is he someone who has neither the professional qualification nor the work experience to be appointed to a GLIC or GLC and got the job simply because of who he knows? Isn’t a government appointee via, for example, the MOF, a political appointee? Or is a political appointee, professional or otherwise, a person who was put there by the previous government? If we define it this way, then the BODs of every GLC will have to resign each time the government changes. Clearly, there is a move by some in the Pakatan Harapan government to make changes to both the leadership and purpose of GLICS and GLCs. Whatever the final outcome of this exercise, it must be done judiciously and transparently, and not out of vengeance. Don’t throw out the good with the bad. The country will end up losing a generation of honest and capable bumiputera professional managers if that were to happen. Not everything can be left to entrepreneurs. Professional managers are important too. The bumiputera corporate community, in particular, needs a good mix of the two.